Wilderness Activity Books began in 2016 by me (Jared Manninen). 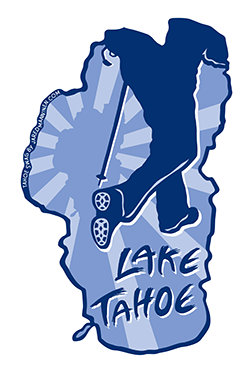 My idea was to take the more detail-oriented information here on Tahoe Trail Guide and refine it for a younger audience (although everyone is welcome to own copies of the books as they are universally fun). Through engaging activities, tales of lessons learned, and education about backcountry skills and etiquette, my series of Wilderness Activity Books inspires creativity and helps you cultivate adventure in your daily life. Color the Tahoe Rim Trail is the first book in the series and, over time, I will publish more coloring, maze, and connect-the-dots books, as well as other activity books with an emphasis on living, playing, and being outdoors. In addition to information about each book, you can also find supplemental and bonus material for each of the Wilderness Activity Book on this page. The cover of Color the Tahoe Rim Trail is a double-page spread illustration based on a view from North Lake Tahoe, near Martis Peak. The Tahoe Rim Trail is a continuous trail that travels around the mountainous rim of the Lake Tahoe Basin. Thanks to countless volunteers working under the leadership of the Tahoe Rim Trail Association, the Tahoe Rim Trail was completed in 2001. Since then, people from all over the world have come to Lake Tahoe to venture out on the Tahoe Rim Trail. Below is the gallery of photographs that I used as reference for the Color the Tahoe Rim Trail coloring book. Each photograph is identified by the same illustration number and title that you will find in the book. Obviously, you don’t need to use the same color palette that’s found in the photos, but people have requested to see the origin points for my illustrations. Many of the photos I chose for this project were not necessarily the best pictures I took while hiking the Tahoe Rim Trail. However, I felt they were the best for use in illustrations that would ultimately be colored (by you!). Some of the illustrations share a close relationship with their reference photos, while others were merely a starting point from which to draw (particularly the ones that were originally in a landscape orientation). 12 - Oregonian Pacific Crest Trail Hiker by the Trail Name of "Sizzler"
15 - German Pacific Crest Trail Hiker by the Trail Name of "Sprinkles"
18 - Southern Californian Tahoe Rim Trail Hiker by the Trail Name of "ET"
19 - Mule's Ear, AKA "Mountain Money"
For making the trip this far down the page I would like to reward you with some bonus illustrations that did not make the cut in the final book. As much as I wanted to include them, I simply had to trim the fat so as not to end up with a book three inches thick. All of these bonus pages to the Color the Tahoe Rim Trail coloring book are hi-res (300ppi), formatted at 8.5 x 11″, and offset to the right so you can three-hole punch them and collect them in a binder if you choose. The easiest way to download them to your device is to right-click and “save image as” or “open in a new window” and then save them to your device from there. I intend to eventually post images of all the pages of Color the Tahoe Rim Trail fully colored. However, there are 79 illustrations in total and I’m quite busy so we’ll see just how long that takes! In the meantime, please enjoy (and hopefully take inspiration from) these examples of my fully colored pages of the book. Please note that Wilderness Activity Books are only shipped to US States and Territories through this website. Currently, the only international option for ordering Wilderness Activity Books is through Amazon.com’s European site. If you’re a retailer, contact me for wholesale prices and shipping options (use any of the contact forms on the sidebars). *Call for title/quantity availability to avoid hassles if you’re driving far to visit any of these shops.